Every day, emergency responders face hazards that are likely to cause serious injury or death in the normal performance of the job. Between 1990 and 2001, an average of 97 firefighters and 155 police officers were killed in the line of duty each year. According to the Centers for Disease Control and Prevention (CDC), between 1998 and 2001 an average of 11 emergency medical service personnel was killed each year. One way to protect emergency responders is to remove them from the situation. This article is going to explore the ways that robots can be used in emergency response to assist and protect emergency responders. Emergency responders have to respond to nuclear emergencies that endanger lives. Two robots have been developed by the Nuclear Safety Technology Center to monitor radiation levels at nuclear accident locations. They are equipped with monitoring devices that can measure different types of radiation levels and communicate the results back to the operation center. The robots are outfitted with cameras that allow the operator to see where the sample is occurring and what is happening at the specific sampling site. One of the robots has an arm that allows it to manipulate valves. The robots are designed to be able to climb over or within rubble, according to Masato Otaki in a 2002 Advance Robotics article. Development and use of robots with the capability of monitoring and performing light work will result in safer operations at nuclear accidents. Responders will know what the radiation levels are prior to entering the hot zone. The ability to manipulate valves and perform light work without entering the hot zone will prevent dangerous exposure to radiation. Robots with radiation monitors can be used at terrorist events like dirty bombs as well as nuclear power plants for remote sampling. Modification to the sensors will result in the robots being able to detect other chemical levels at hazardous material accidents, thereby allowing responders to know what the chemical is and where the hot, warm and cold zone is located. Robots have the capability to enter and visually inspect areas underwater. The Center for Robot-Assisted Search and Rescue has developed a robot to inspect damage to bridges that has occurred during storms or accidents. The robot was used to inspect the Rollover Pass Bridge that was damaged during Hurricane Ike. The debris from the bridge was distributed around the bottom of the bridge under the water. The water contained sediment that prevented the divers from being able to inspect the debris field. The water was flowing swiftly, which prohibited the divers from being able to stay in one location long enough to safely evaluate the bridge and the debris field. Resembling a small boat, the robot was designed to float on the water and use cameras and sensors to acquire images of the debris and bridge under the water. It was capable of withstanding the water current and remained in place so that information could be acquired and transmitted to the operators. Temperature and visibility affect the capabilities of divers. Robots, similar to the one that inspected the bridge, can improve the safety of dive team members. Robots capable of floating in water with cameras and sensors can be used to locate numerous objects in the water including cars and weapons. Robots that go underwater and take images are currently used by dive teams to search for people that have drowned. Another use of underwater robots is to inspect the stability of dams that have been damaged by accidents or that have been eroded by water. Search and rescue activities performed at collapsed structures are extremely hazardous to emergency responders. The use of search dogs requires the handler to be supported by the damaged structure. In a 2004 Communications of the ACM article titled “Rescue robotics for homeland security,” Robin Murphy noted the use of probes requires the operator to be on top of the structure and the probe will only reach 2 feet to 4 feet down in a straight line. The robots used at the collapse of the World Trade Center allowed the operators to see into the rubble and locate victims without endangering themselves. Since the World Trade Center response, search and rescue robots have been modified to perform other tasks. According to Albert Ko and Henry Lau, newer robots are capable of communication with the victim along with delivery of food and water. Emergency responder safety increases as the capabilities of search and rescue robots improve. Robots that allow communication with victims provide information to responders on their health as well as the location. Providing water and food to the victim allows the responders to take the additional time needed to ensure their own safety. The military has a robot prototype that is being designed to carry out wounded soldiers. Incorporating extrication potential into search and rescue robots will prevent responders from having to enter hazardous work environments. 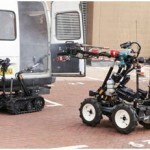 Search and rescue robots can also be used to locate land mines and bombs that are hidden as well as assist police departments in defusing bombs. Search and rescue robots may be modified with sensors to assist in areas damaged by earthquakes. Robots are already designed to enter buildings and climb over obstacles and stairs. Addition of a sensor that allows the robot to locate structural components, such as studs, and inspect cracks in concrete will allow the operator to determine the stability of a building. Preventing emergency responders from entering structurally unsound buildings will result in a reduction in the loss of life. Thermal imaging cameras can be attached to robots to allow operators to determine the temperature of walls in a structure. Temperature readings can be used to determine if there is a fire in a damaged structure and if the location is likely to have any survivors. The robots covered in this article have been designed for specific uses. They can be used in other situations through modification of the sensors and cameras. A majority of the robots covered in this article are not used in actual situations, which might be due to “human-robot trust” as discussed by Peter Hancock. Future research needs to be conducted on why robots are not used often in emergency response. Determination of why robots are not used can result in solutions to issues currently preventing the incorporation of robots in emergency response operations.